Niger Tornadoes FC, based in Minna in west central Nigeria, suffered relegation from the Nigeria Premier League 2012, ending the season as number 17. Niger Tornadoes FC has used at least three goalkeepers during the season. As far as I know, Mustapha Salihu (born 01.12.1987), formerly of Kwara United FC, was preferred towards the end of the season. Salihu played for Tornadoes during the Nigeria Premier League 2007-2008. Segun Ayo, formerly of Plateau United FC, played regularly during the first part of the season. Eze Fidelis, signed from JUTH FC before the season, also featured regularly during mid-season. To be honest, I am not sure which of these players that should be defined as first-choice goalkeeper. The experienced Benedict Atule (born 20.12.1987) was a key defender, mostly found at right-back or in central defence. Atule has played at least 10 seasons in the Nigeria Premier League, for clubs such as Kano Pillars FC, Lobi Stars FC, Enyimba FC and Kwara United FC. The versatile defender Emmanuel Ariwa (born 27.12.1989), comfortable at left-back, in central defence or as a holding midfielder, is another important player. Gwaza Iorliam, a towering central defender, was one of the revelations of the season at Tornadoes. Promise Onuh (born 05.04.1987) is a powerful central defender, signed from Sunshine Stars FC. Ibrahim Ndala (born 02.05.1985), comfortable at left-back or centre-back, has plenty of experience from the Nigeria Premier League. Ndala was captaining Niger Tornadoes FC on a regular basis. Adeyemi Bolaji played fairly regularly in defence and Mohammed Abdullahi was also a good option. The versatile Simon Innocent, mostly found on the wings or as a full-back, featured for the Nigeria U-20 national football team during the season. In midfield, Azubuike Okey and Chinedu Justice were important players. Okey, a petit defensive midfielder, was one of the revelations of the Nigeria Premier League 2012. In May 2012, Okey was training with the Nigeria B national football team. The picture is of Okey and was found on MTN Football. Justice has played regularly for Tornadoes for at least four seasons. The lanky Kingsley Odoh, signed from Lobi Stars FC, can feature either as an attacking midfielder or as a defensive midfielder. Abdullahi Shehu, fondly called “Romario” and Sabole Shehu are both creative, attacking minded midfielders. Youngster Mohammed Hamidu Kawu was an option in midfield. Daniel Essien Etor (born 05.05.1992) is arguably the most creative player at the team. Etor, often used as a left-winger or attacking midfielder, is a pacy and skillful player, known for dribbling and mobility. Etor was signed from Bukola Babes FC during the Nigeria Premier League 2010-2011. Kola Abegunde, signed from Rangers International FC, played fairly regularly at the right-wing or in other attacking roles. Ezekiel Mba, an attacker or winger, had a minor breakthrough during the second part of the season. 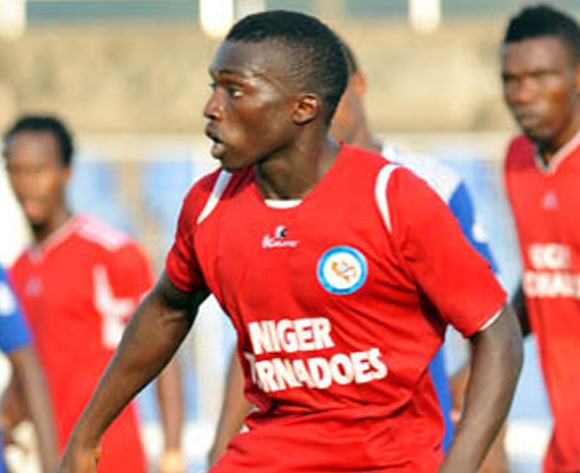 Sibi Gwar (born 09.09.1987) is the star player at Niger Tornadoes FC and top scorer with 16 goals. Gwar is a strong and skillful striker with matches for the Nigeria B national football team. Azuka Ebinum, a burly striker, scored five goals for Niger Tornadoes FC before he joined Warri Wolves FC during the mid-season transfer window. Ebinum, formerly of Zamfara United FC, was sorely missed as none of the other strikers at the club was able to partner Gwar as good as Ebinum did. Son Hingir, formerly of Lobi Stars FC and Anambra United FC, scored a couple of goals without making headlines. Lukman Mohammed was more effective and scored four goals. Abashi Barnabas was also an option in various attacking roles. Other players that featured during the season include Patrick Sylvester Agada (born 02.12.1990), Nathaniel Orji, Karimu Shaibu (born 10.12.1984) and Mohammed Zubairu. Sibi Gwar 16, Azuka Ebinum 5, Lukman Mohammed 4, Daniel Essien Etor 3, Chinedu Justice 3, Son Hingir 2, Ezekiel Mba 2, Kola Abegunde 1, Benedict Atule 1, Gwaza Iorliam 1, Ibrahim Ndala 1, Kingsley Odoh 1, Nathaniel Orji 1.